The crisp was easy to make, and rather delicious (note, I’m not normally a fan of rhubarb, so that’s saying something). Warm, sweet filling, with a chewy, crunchy topping, it was exactly what we were looking for. I also really liked that some of the ‘crisp’ mix lined the bottom, so everything was evened out more than it were simply two layers. More bonus points for the fact that you can use slightly ‘bendy’ rhubarb, since it will soften while cooking anyway. Although we didn’t have any in the house (the horrors, I know! 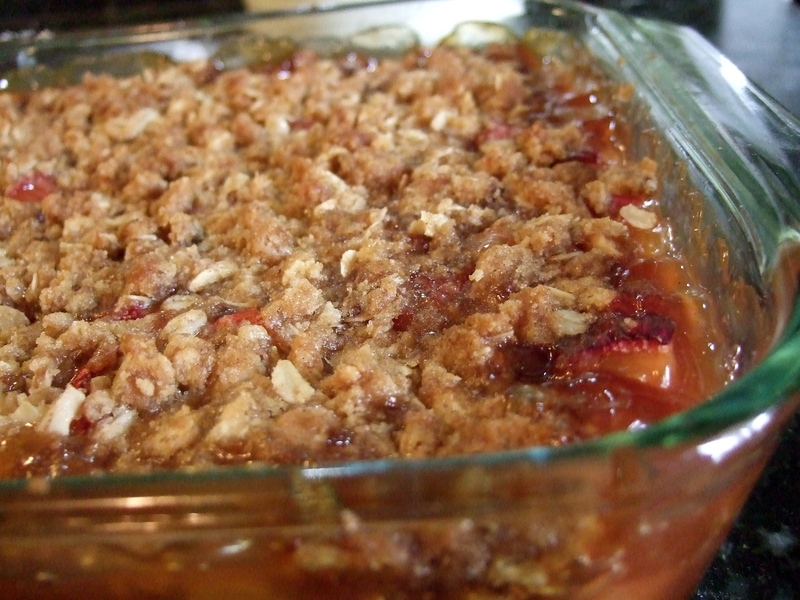 ), I think this would be absolutely perfect with a scoop of vanilla ice cream on top. Combine flour, oatmeal, cinnamon, 1 cup brown sugar, and melted butter. Spread half of mixture into 8×8 pan. Cover with diced rhubarb. Cook until thick the other cup of brown sugar, water, cornstarch, and vanilla. Pour over rhubarb. Add the other 1/2 of the crumb mixture.